Senators Murray (D-WA) and Hirono (D-HI) and Representatives Polis (D-CO) and Castro (D-TX) introduced today legislation to support states that invest in higher education access for all students, including undocumented students. The Investing IN States To Achieve Tuition Equity (IN-STATE) for Dreamers Act would eliminate a bureaucratic obstacle for states that make in-state tuition rates available to qualifying students regardless of immigration status, and it would provide $750 million in increased funding for states that exercise their option to make college education more accessible. A First Focus analysis on higher education barriers facing immigrant students shows that access to in-state tuition rates is important for students to attend college. The report, Access to Education: Challenges and Opportunities for Immigrant Students, highlights the potential gains from improved in-state tuition access and the elimination of federal obstacles for immigrant students. The map below is from that report; it shows the various in-state tuition policies across the country, updated with new information. This legislation builds on progress made across the country to increase college access for all students. 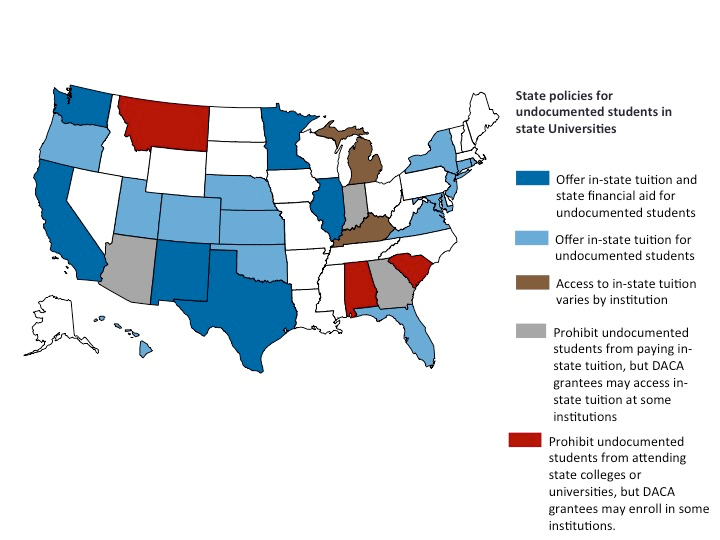 At least 21 states offer in-state tuition rates for immigrant students, though some still restrict this practice, and five states allow undocumented students to access state-based financial aid. The Murray-Polis bill would support states with proactive in-state tuition policies and while helping states that have not yet implemented in-state tuition policies to help immigrant students access higher education. By lowering barriers to higher education for these students, states will contribute to the long-term health of their economy and allow children and youth to reach their full potential. The bill also specifically defines recipients of Deferred Action for Childhood Arrivals (DACA) as students who would be eligible for in-state tuition under the legislation. This is an important provision to increase the positive impact of DACA, which gives immigrant youth work authorization without the fear of deportation, and has allowed immigrants to continue and increase their contributions to their communities.